Gary is a man of few words and possesses a calm and gentle presence. 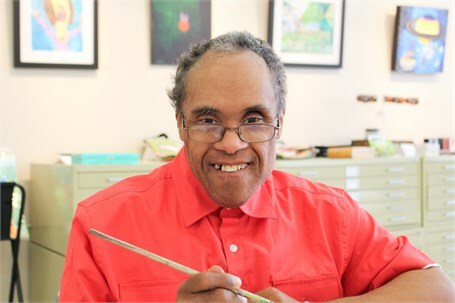 A native Washingtonian, Gary is one of Art Enables’ more recent resident artists. His work, largely abstract, possesses, like Gary himself, a warmth and almost Buddha-like quality. Heavily layered, his pieces, and the people in them, are simultaneously complex and simple. His minimalistic style of detailing people and faces evoke a depth of expression and emotion that is immediate and powerful.